The graphic designer Aarne Karjalainen began his art studies at the Viipuri Friends of Art Drawing School and then continued to study at the Finnish Art Society’s Drawing School in Helsinki from 1921 to 1922. In 1928, after having worked as a graphic designer at Tilgmann’s printing house for six years, Aarne Karjalainen moved to the advertising agency Uuden Suomen Reklaamitoimisto. While he was there, he was commissioned to create a stamp for the Bank of Finland’s own security printing house. Apparently he enjoyed this task and in 1934 he moved over to the security printing house as a designer artist. There he worked with, among others, the artist and illustrator Signe Hammarsten-Jansson (the mother of the writer Tove Jansson). Karjalainen later became the manager of the artistic division of the Bank of Finland’s security printing house. He retired in 1963. Among the items Karjalainen designed is the 5,000 mark banknote, which was launched in 1940. He also created thirty-six different stamps and a smaller number of postcards. During his time at Uuden Suomen Reklaamitoimisto he designed a few posters as well; one, for example, was for the airline company Aero in 1929. 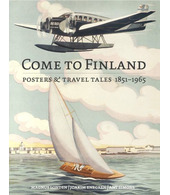 This particular poster is also the cover of the “Come to Finland” coffee table book.